Even though most job descriptions for sales roles typically say that the candidate most be “self motivated”, as a business owner you’ve probably realized by now it is wishful thinking that merely hiring “self motivated” people will by itself, lead to creating high performing sales teams. 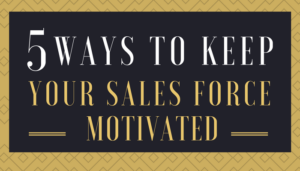 Whether you have just one or two sales representatives or you have several dozen, either you as the business owner, or your sales manager (if you have one) need to play a vital role in keeping your sales force highly motivated. Holding regular, effective sales meetings with your team is one way of keeping your team highly motivated. The key word here is “effective”. So, how does one make sure your sales meeting is effective? A: Bob, you are absolutely correct on having regular meetings with your team. Regular sales meetings is an essential key to grow your business. Every member of your team is expected to be better each day. I have come up a meeting structure for you which you can use to help motivate your sales force. I have used this same method myself in planning 1,000+ sales meetings I’ve delivered over the years. Whether you’re have a team of 11 people, 80 or just 4 sales people, it sets a positive tone and energy to kick off your sales meeting with sincere recognition. Find something to recognize in some or all of your meeting attendees. In addition to verbally recognizing people it’s important to add visuals. People like to see their names in writing. It can be as simple as writing congratulation messages on poster boards and plastering them throughout your conference room or as formal as having a new name engraved each week or month on a sales award plaque. You can reinforce that recognition in bi-weekly emails to your sales team as well as including it in the printed version of your sales meeting agenda. Recognition is especially addicting for sales people, so make sure you apply generously to your team. When you recognize positive behavior you attract more of that same positive behavior. Avoid falling into the trap of negative thinking like — “why should I recognize them for just doing their job?” Because when you take that philosophy you will likely end up going many weeks without giving any recognition at all. As a mother, anytime my husband or kids tell me I made a great dinner it not only makes me feel appreciated (even though it’s my job to feed them) it also motivates me to make an even better dinner the next meal. Making your sales people feel appreciated goes a long way. This is the housekeeping tid-bits — FYI kind of stuff you want everyone to be aware of and note in their calendars, project folders, etc. Here are two new marketing resources now available to you. Never undermine the importance of ongoing training. Sometimes I hear from some grow your business that they don’t need to train their top sales people because they’ve been doing their jobs for 10 years, and they know what they’re doing. That’s like expecting pro football players to skip the training camp and send them right into the kickoff game – bad idea! Spend 30-45 min during your weekly sales team meetings to help your people improve one specific skill they use and need, so they can better perform in their jobs. Trust me, even for your seasoned sales reps you’ll never run out of drill-for-skill content. It’s often more effective for your people to be inspired by the milestones achieved by their own colleagues than just being talked at the entire meeting by their boss. You want to leverage the fact that sales attracts people who tend to have a competitive spirit, so inviting the week’s top performer to teach their peers is a powerful motivation for both for the person teaching and for their peers taking notes. The person teaching ends up feeling like they now have a reputation they need to keep. And, their peers end up thinking — “hey, if they can do it, so can I” or “I can do even better than that”. So, invite one of your sales leaders to share for 5-15 minutes on how they achieved ______. How I got 85% of my leads to return my calls this week. How I got 200% more referrals this month. How I got all the decision makers to attend the 1st presentation meeting. How I have my best sales month ever. Inspiration appeals to their competitive spirit. It raises the bar and provides proof that it can be done. Click To Tweet. This is the fifth and final part of your sales meeting. You, as their boss/sales manager make a big impact in either motivating or de-motivating your sales team. We see this happening all the time in sports. A football team won’t play their best if they’re constantly barked at by a dictatorship style coach or by a coach who appears hands off and indifferent. They have to want to excel. Even the people who insisted they were self-motivated will still perform far better with a deliberate dose of motivational words from you each week as their leader. I always like to see a weekly sales meeting end with a motivation piece with what I call a wind up talk. But, what they do get passionate about resonating with why you do what you do. They rally around what you believe as a company, but more importantly, that you believe in them. People inherently, want to be great and do great things. Your motivational wind up talk should serve to helping them become the champions they have the potential to be. Why this week is different? What is at stake this month? What is the target you want them to stretch to reach and why should they care? How can you help your people get out of their comfort zone? What’s it all for this quarter? What personal success skills do you want to help them develop? The power of perseverance, tenacity, positive expectation, resiliency, resourcefulness, etc. QUESTION: How often do you run sales meetings with your team and how do you know it was effective? Please share your comments in the comment box below. © Copyright 2018 Paramount Business Coach All rights reserved.